Villa Amber is the perfect villa for a family holiday! 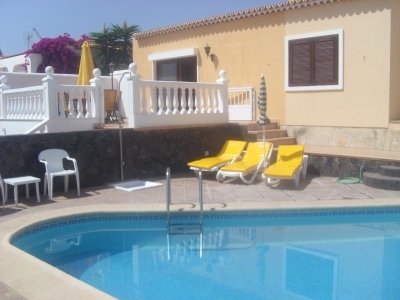 Situated in the resort of Callao Salvaje, it is in walking distance of all the amenities, being only 5 minutes walk from the nearest restaurants, bars, supermarkets etc. A car is therefore not essential. The main villa has 3 bedrooms and 3 bathrooms and 2 ensuites. And then a staircase leads to a luxurious, modern apartment with which also has 3 bedrooms, as well as a patio area for alfresco dining. Both the villa and apartment have plasma screen TVs and DVD players. Villa Amber is very spacious and tastefully decorated throughout! The villa and apartment each have a separate entrance and the villa is very private and secure and not at all overlooked. There are numerous terraces around the villa with sun loungers and patio furniture for 12 people. Some claim that Callao Salvaje has more hours of sunlight per day than any other resorts in Tenerife. The villa enjoys fantastic sea and mountain views. A deposit is required to secure the booking and then the balance is payable on arrival. The nearest sandy beach is only 10 minutes away and the nearest pebble beach only 3 minutes. Smoking is allowed in this villa, as well as pets. A refundable security bond of £100 is also payable on arrival. This will be refunded back to clients before departure.